Having problems of a bare space inside your house? Are you confused on how to create a positive vibe around it? Or do you want your indoors to have a touch of Mother Nature? The best answer to these problems is simply by placing some indoor plants inside your home. Isn’t it fantastic? Or do you still want some good reasons for it? Indoor plants are common ornaments inside the house, ever since in the past centuries. It was used in countries like Japan, China, Egypt, Greece, and other countries to beautify the place, mosque, dining room, or even a simple bedroom. Even up to the present, it is widely used in different countries; with the same purpose to give an empty and dull space at home a sort of “face-lift” or an aesthetic touch. But the use of these ornamental stuffs is more than just for decorations. Nowadays, many home arrangement experts or interior designers would recommend to have some indoor plants in different spots inside the house, because it gives a positive energy to the individual members of the household. It refreshes your soul, and it can even help in getting rid of that exhausted feeling, thus giving you some relief from stress. Moreover, indoor plants are ideal if you want to see natural wonders upon waking up in the morning. Having one inside your bedroom will give you the vibe that will make you ready to face the rest of the day. It simply clears your mind from worries, and rejuvenates your inner being. Another purpose of indoor plants is that it get rids of air pollution inside the house. Family members constantly produce carbon dioxide when they are undergoing a process of gas exchange, where oxygen is taking in, and carbon dioxide is blown off. The carbon dioxide gas is a waste or a polluted gas, and green plants are absorbing this for nutritional purposes. While on the other hand, oxygen is vital for survival of our cells and tissues to maintain the normal functions of the body. In return, Green plants are producing this so-called “good gas” as well. 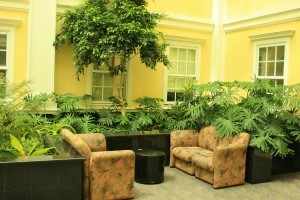 Having indoor plants will contribute for a balanced air production and exchange inside the home. There are different indoor plants to choose from, some of which are the Chinese evergreen, Chamaedorea palm, Cactus bonsai combo, Braided Ficus tree, Angel ivy ring topiary, Moth orchid, Ponytail palm, Myer’s Asparagus Fern, Cast Iron Plant, Panda plant, Golden Stars, Swiss cheese plant, Slipper orchid, Rabbit’s foot fern, Baby’s tears, Peace lily, English Ivy, Wax plant, Crown of thorns, and the Prayer plant. So if you are still having similar questions in your mind as what have been stated earlier, it’s about time that you should think and consider turning your indoor spaces into something fresh, lively, and most of all, green. And do such, start gathering indoor plants today. And if you do not have a green thumb, contact a professional interior plantscaper like Growing Expectations at Residential & Commercial Builder in Sydney | Hall Interiors.